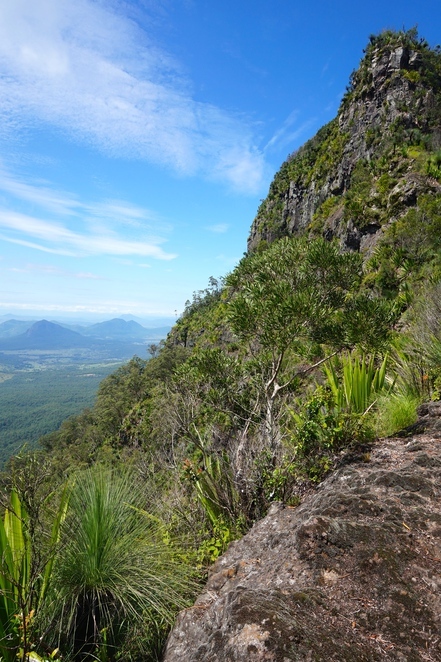 Queensland is graced with high mountains and beautiful beaches. The difficulty sometimes lies in making a choice of where to go and what to see, especially if you are short of time and may only have a few days here. One hike I would warmly recommend is the hike up Mount Cordeaux. It is part of the Main Range National Park. The trail is ambitious without being exhausting, with a gradual incline, becoming a little more steep as you reach the top rocky platform. You are passing through some wonderful forests of eucalypts, and ferns, with grass trees and orchids at the top. Lyre birds may be singing and the characteristic call of the whip birds may be heard and carpet pythons sometimes make their shy appearance too. The walk which is approximately 6.8 kms may take some 2.30 hours and ends on a rocky platform with views of Mount Mitchell but also the surrounding plains as far as your eye can see. From Brisbane take the Cunningham Highway towards Cunningham's Gap. The journey is approximately an hour and a half from Brisbane. Some 116 kms. The road is absolutely fine, with only some windy bits as you come closer to the Cunningham pass. At the top turn into a car park just off the main road to the right. You don't have to be super fit to do this hike but it will take you a good 2 hrs to get to the top. Perhaps longer if you like me like to stop and take in the views, the wildlife and the vistas. Take in the trees and the wildlife – we came across a very sleepy python who slid away from us quickly. Take in the beautiful butterflies and moths if the season is right and the flowering trees. Enjoy a delicious picnic at the top and make a slow descent for a well earned cold glass of sauvignon blanc.